So I still have 285 T-shirts to trade in order to complete my tenth trade. I'm being called to think very, very creatively about how to find the 285 people to trade with. Nikki contacted me and said she wanted one of my T-shirts and would trade for it for a place on her small business startup workshop. So I put the word out and within a day Chris had found Michelle who was starting her business and wanted to do Nikki's course, and for her it was a bargain to "pay" Nikki with a T-shirt and at the same time make that T-shirt count as a trade with me. Michelle got to go to the workshop. I got one less T-shirt to trade. So- below are the details and if you want to be a part of my big tenth trade and the onematchstick story, but you're not that into T-shirts, then let me know if you want to trade for Pilates, Artwork or Payroll training and we'll make a Three-Way Deal. Ok? David du Plessis has been offering Pilates classes for many years, and – being my Pilates instructor- I can vouch that he knows his stuff and gets results. He combines Pilates with Gyrotonics and Kettlebell training, and is uber-cool. His studio is in Fourways, Johannesburg, at the centre where I have my temporary office (temporary until I get my onematchstick office). He is offering four private Pilates classes that could be used one a week for a month, or all four in four days- you decide- in exchange for three of my Springleap T-shirts. So if you are keen to try out Pilates in the Fourways area, or get back into it, and get super fit and strong and have a laugh while you work out, plus get the four private session at a discounted rate- CALL ME!!! "Tuesday Houston is a contemporary South African artist making a significant impact on the local art market." She's been arty since – well forever! She's even dabbled in welding metal into gorgeous jewellery and is very into fashion and stuff like that, especially fashion for kids. She's offered me TWO limited edition lino prints (about A4 in size) which are very popular, and unframed go for R900 in a Gallery. All she wants is two T-shirts in return for one of the prints, and we can post the print to you! What a sweet deal! 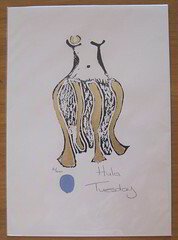 So if you want one of Tuesday's limited edition lino prints- CALL ME! When he's not helping people demistify payroll for good, he's working on his record label dedicated to assisting indi artists, called Liber8. He's also just a man looking to play his part on this beautiful planet. And his part in the onematchstick story is he's offered his audio payroll workshop for ONE of my Springleap T-shirts. It's worth R399.99, he's running a special right now for R279.99, but YOU can get it for R219.00 if you do a Three-Way Trade with KK and me. If you want this audio payroll workshop – CALL ME! So it's as easy as 1 – 2 – 3 for a three-way trade with me.